Arizona kneeboard lessons is such a fun water sport to start with and especially for kids and teenagers. You have to learn balancing the board while trying to get your knees on top of the board, and set in place. Once a person can bring both knees up at the same time and keep the kneeboard level while doing it; the progression from there is quite simple. Arizona knee boarding lessons is one of the oldest water sports, and is popular with young kids who can start with their knees in position. 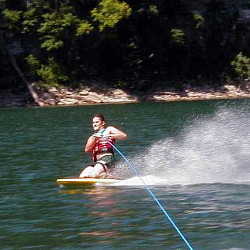 Arizona Boat Rentals offers knee boarding lessons at all lakes and reservoirs in Arizona. Read on to find out how to get up on a kneeboard. The most common method of starting when it comes to Arizona knee boarding lessons is the belly start. You start out lying down on your board with your stomach strap pointing towards the front of the board. Make sure the nose of the board is sticking up out of the water. Grasp the rope and kneeboard with both hands. Once the boat starts moving you should pull your knees forward so that they fit into the padded knee-wells of the kneeboard. When doing this it is important to keep your weight back and don’t lean too far forward and make the board nose dive. As you get balanced on the kneeboard, you can let go of the rope with one hand while pulling the strap over your knees. Make sure you tighten the strap until it feels secure. While doing this try to keep your arms extended and slightly bent.